My grandpa went back to his home happily last week, after staying with us for about 4 months. 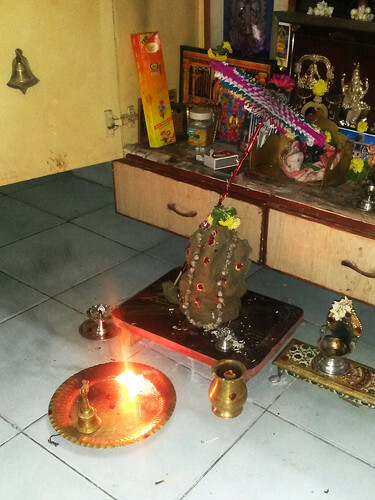 He spent only couple of days with us after discharged from the hospital and knowing his desire we didn’t stop him going to his home but also felt this change or transfer to his familiar environment could improve his health condition and the thought of coming back to home will give him confident to do better. His back sore due to confine to bed in the hospital is also healing well and he started to have normal food like before but only he couldn’t stand and walk. But we hope he regain the strength very soon and able to walk by doing physiotherapy. I never thought a person could change such drastically in a very short span, though I don’t want to refer directly who he was, it certainly affects the lives of my grandparents now. My grandma was in need of a helper to support her in taking care of grandpa. Until being here, there doesn’t need someone as we (and my uncle family) supported her in every way in taking care of the grandfather, the attitude of drop out from their own son seems trouble them surely. I feel that supporting someone is not that only physically assisting but giving them hope to believe (if they are elders or disabled) that they are not alone and even if you could not talk in a way, a small gesture and smile could do much better. Apart grandpa, I experience some issues with health lately to put me feel trouble, though they aren’t anything serious, at least now, I went for a respiratory functional test last week and found poor breathing ability/capacity. I had some difficult with breathing last week, which was very unusual for me and without any delay I check with my doctor and took the functional test in Fortis Malar. It is a diagnosis conducted only in big hospitals, because this kind of test are not taken frequently by many and being an muscular dystrophy patient trouble with breathing is a normal thing after certain period and the main cause for this is believed to the severe lung infection I had 5 years back or due to some other reason my lungs have been shrunken little to make inadequate breathing space. But right now I have no trouble and I breathe easily but I am more careful to do my breathing exercise regularly and increase in terms. For the last few days, my back pain takes new shape and shifts to my upper back to hold breath sometime. My therapist suggests it is perhaps problem related to neck and was advice to sleep without pillows and reduce my usage of laptop or change the position of viewing. To make my problems little difficult my new wheelchair was sent back for rectification and it expected to take more than a month (according to the manufacturer) to put right things I needed. I had certain comfort in that bucket seat and nothing felt painful when reclining towards its cushion back seat. Hope they haven’t took much time to settle my wheelchair before things become more difficult. 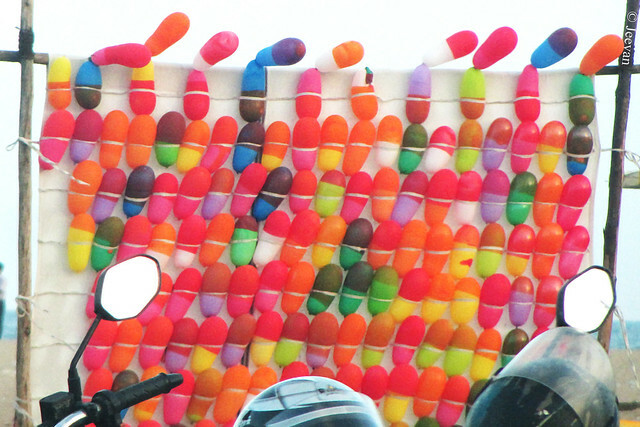 Here's another multicolored image for the RGB Monday series... comprising red, green and blue. Thandikudi is a wonderful place to enjoy bird watching and it’s a paradise for birds. 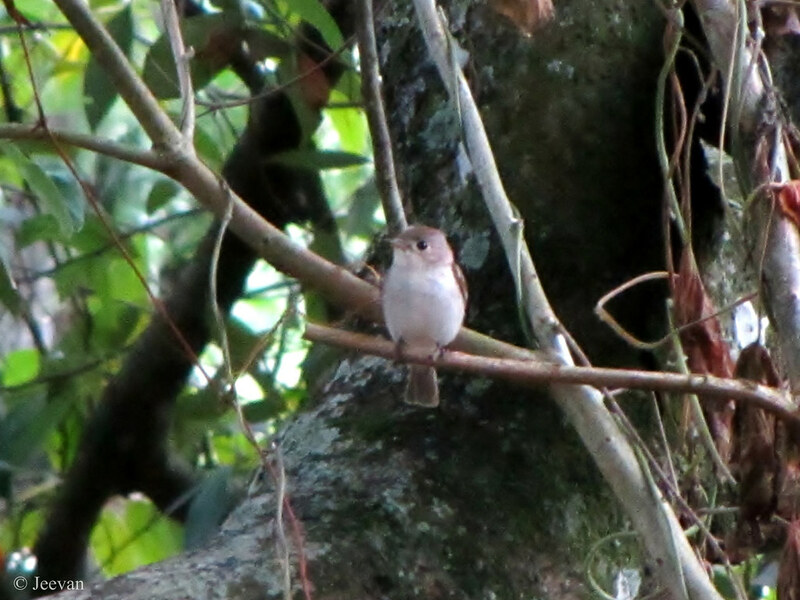 When i was staying amid the coffee plantations and canopy of trees, in the Narumana Kudil (fragrant huts) maintained by the village council there, I got to watch many birds and listen to distinct voices of same and one of it was the cute little Asian Brown Flycatcher. The Asian Brown Flycatcher is a small passerine bird in the family of flycatcher – Muscicapidae, and it is an insectivorous species which breeds in Japan, Eastern Siberia and the Himalayas. 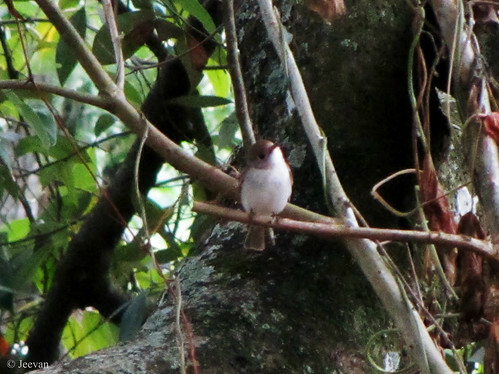 It is migratory and winters in tropical southern Asia from southern India and Sri Lanka east to Indonesia. 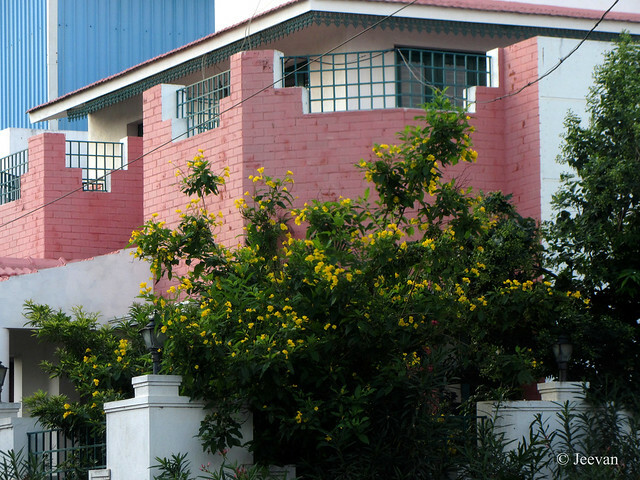 This is a house opposite to my great aunt’s in Neelankarai, Chennai, and I casually shot these photos at different time period and it is a pretty house with flowering shrubs around and my point of shoots here, were on flowers. It was kind of bungalow and I have seen it from the day of building and the house sits on a high platform or basement that was supported by deep foundation! As I know a couple of elder people were residing there along with their son or daughter, both seems to be married. The house has two spacious baloneys extends from the first floor, has a tiled roof and portico... they have also captured a theme of red, green and white to the building that colors the roof and balcony, and grills/rails and windows to look neat. My grandpa had discharged from the hospital and was brought back to our home against his wish to go to his home. He’s doing much better now and breathes easily. He had been admitted to hospital with complaint of chest pain and whizzing on Sunday night (13 Sep) and was kept in ICU for 4 days and transferred to ward when his condition becomes stable. He had been on oxygen mask almost his stay and until his breathing becomes normal. His diet had been completely depended of liquid food and he was fed through tube and only a day before his discharge he was on normal feeding through mouth. So he looks frail to even sit on his own balance and his back was exposed to sore due to confined to bed all these days in hospital. This has been a great setback in his journey after his post hospitalization (3 months back) and he showed great improvement in his health and activity after doing physiotherapy. But now it seems everything has to be started from the much earlier stage and would be very difficult to achieve what he had gained these days. Doctors have said his heart is very weak and he could not be active like before and also anticipating him to do much is not possible. He’s very intense to go to his home and only because of his pressure we moved him out of the hospital, but more than moving out of hospital he’s eager to go to his home rather coming to ours. He was in anticipation to go to his home with 3 days ahead before he was shifted to hospital with chest pain make him feel disappointed. Once moved out of ICU, but being there no one was allowed to interact with him and being on oxygen mask, he couldn’t talk as his whiz when try to speak, he openly and indirectly conveyed his wishes to go to his new house and his attitude also conveys the same. I heard, he seemed vigorous when said go to his home and at same time when doctors extend his stay at hospital the expressions become anger and he showed less response to others. 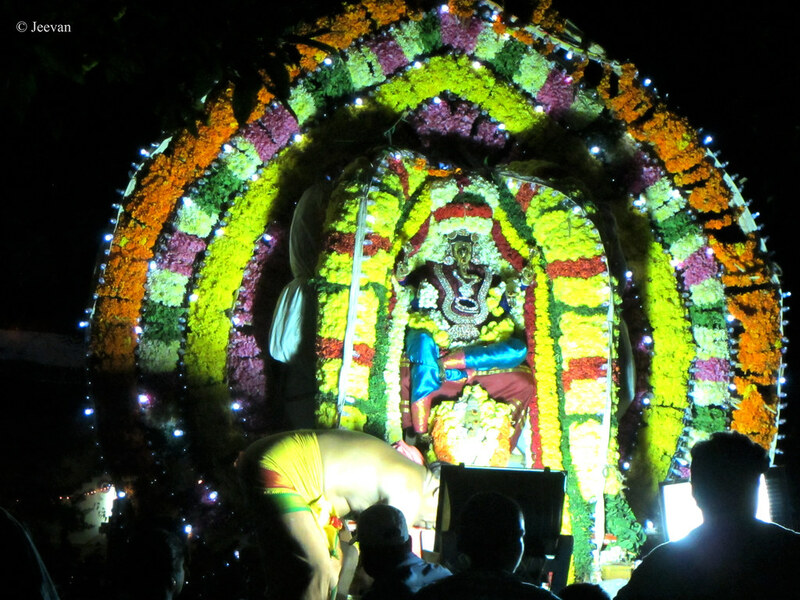 He arrived at home in ambulance, as he was unable to stand, and thinking that he had come to his home he was seen happier and seeing me he enthused as if I was visiting him at his home. We understand his desire to go to his home, but practically it seems very difficult with grandma handling him alone. Though there was his son and in-law, but being there always for them is no possible as they have their own family and work to look after, we decided to hold them sometime until grandpa put pace on him. But I am not sure they stay that long and to make him feel not frustrate, he will be transfer to his home in a day or two to decided to return back or stay over there. 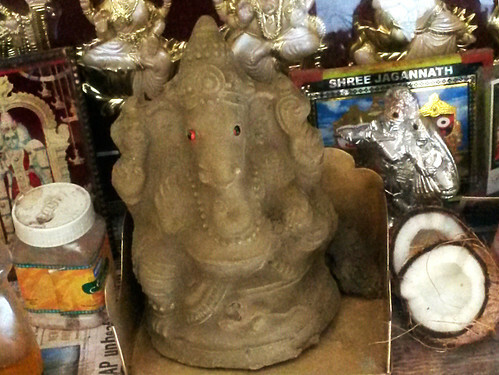 Ganesh Chaturthi is a grand festival in India, devoted to Ganesha – a prime deity worshiped by Hindus. 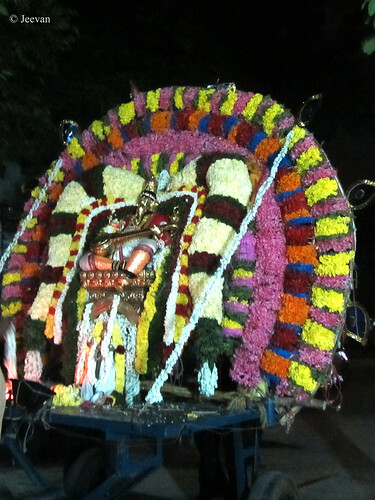 Here I like to share some photos relevant to festival at home and Ganesha procession from our street temples. 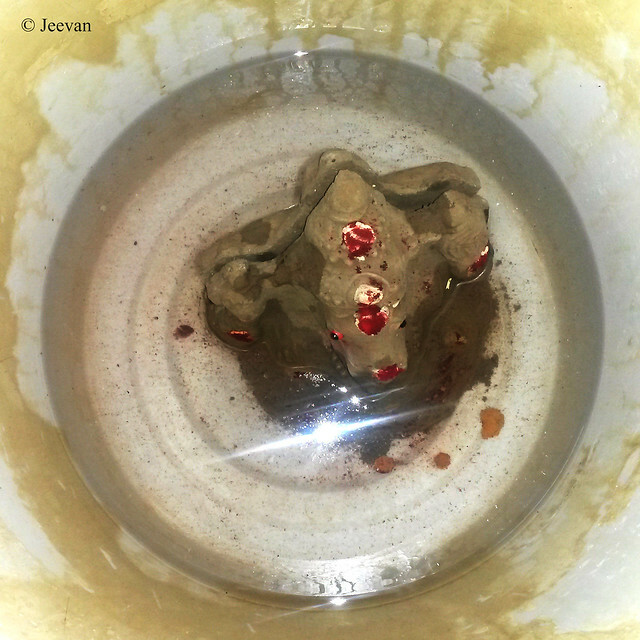 Clay idol of Ganesha immersed in tub water to dissolve... to be poured for plants and shrubs once turned liquid. This is a process we have been practicing for last 5-6 years, rather immersing into water bodies that result water pollution. Last week I went to a corporation park in the neighborhood, in my new powered wheelchair before yet to send it for rectification. Though it isn’t a big park, there’s a nice footpath to come around and it has a fence portion where some shrubs and flowering plants and crotons are preserved to look good and feel greenish. The other part of the park has a play area for kids to enjoy swings, slides and seesaw and also has some colorful benches (made of planks and concrete) for elders to sit and relax while kids play around. I spent some time there watching things happening around and fun checking kids sliding and swinging around. I saw a couple with a pair of kids, who were left to play while they work on the laptop, and in between their job, perhaps looks some office work, the mother put the kids to play. An elder man got to occupy a bench for long time, keep watching me taking some shots using the mobile, and a middle age couple was relaxing aside after taking some walks around the park. 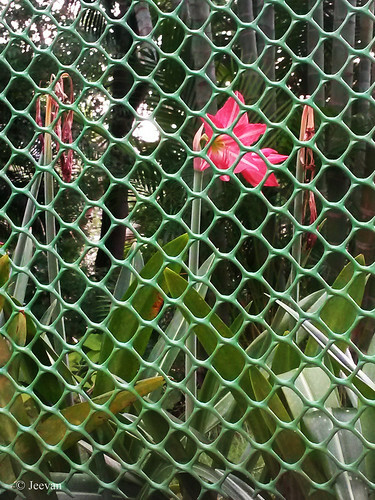 The fence that covering the green area seems to be a kind of chain-link, daubed in green. Seeing the fence I couldn’t avoid thinking about Good Fences run by Run a Round Ranch, so clicked to present/link here. 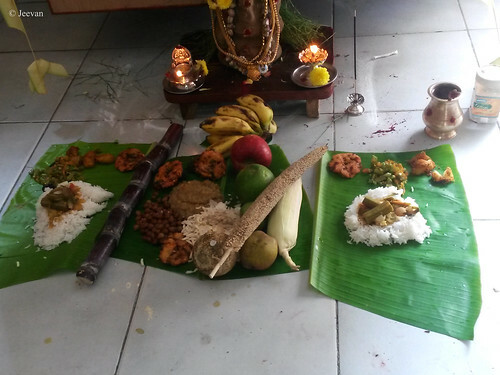 Just 3 days ahead for my grandparent’s to return to their home, as per their plan to shift to their newly built home after staying more than 3 month with us following grandpa’s hospitalization and ill being, he was once again at hospital from last night. Mygrandfather experienced chest pain late at night Sunday and continue to whiz and find difficult to breath forced us to admit him in hospital without delay. It was post 11 pm and we are yet to sleep after watching my favorite talk show (Neeya Naana) in TV, grandpa waked up granny complaining chest pain and we gave him Gelusil, thinking it may be heartburn. But he continues to sweat and whiz, so we thought it could be perhaps cardiac arrest and doesn’t want to risk waiting and watching. Glad he was able to stand and walk, so instead calling ambulance we took him in the car to the hospital, suggested by the doctor on the call, and he was admitted to ICU. His condition seems to get little worse on admission and was put on oxygen mask to breathe ease. Doctors said there’s ‘fluid in the lungs’ and that’s why he had trouble breathing and whizzing heavily. First they said he had no cardiac arrest or any trace like that in the ECG, but later in morning confess he had a mild attack following an echo-cardiogram test. For the last 24 hours he has been in ICU and doctors had decided to keep him there for two more days to monitor his condition and he still breathes on oxygen mask as his breathing ability continue to be inadequate, he’s also on medicine to remove fluid in the lungs. Only if his lungs become empty, it is believe he could breathe normal and during this time his heartbeat also touched the lowest which makes us all worry. He has been feeling chest pain more than a week, but he hadn’t told anyone of us and we also haven’t noticed any symptoms about us as he continues to act normal until hitting the bed that night. Being a Parkinson’s patient he could not talk much and also experience unsteady mindset sometime to forgetfulness. 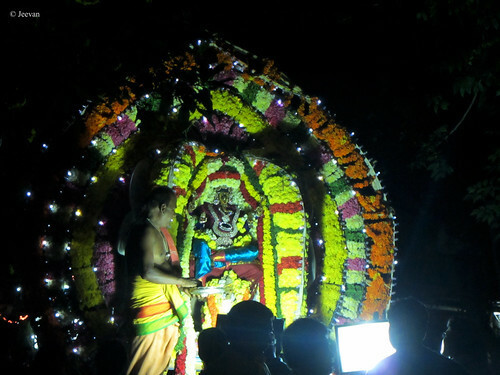 He seemed cheerful for the last two days as they anticipated going back to their home and he even conveyed his adieu very early to me thinking of going home. Hope he gets well soon and go back to his desirable home – the comfort zone and familiar in environment, perhaps! Who don’t like cats and their cute purr? Long time back we had cats as our pet and it used to be fun watching them playing around. But that’s a different story for another day. For last few weeks we were experience quite annoy because of the cat’s purr – Meow! The cats are cutest animal and their purr is of course somehow pleasant, but the matter is when they cross the limit and hangs around frequently on the wall and make noise in a way disturbing, not us, but our pet dog, Maya. Generally it is believed and witnessed by many that cats and dogs don’t go together and ours is no more different. The cat in the image is the main culprit interrupts the peaceful slumber of our pet dog often by its curse. Purr! Actually she/he isn’t grown enough to become a cat, because I saw her/him as a kitten less than a month back, perhaps he/she should be in her pretty teen now to be naughtier. : D It all began from the day my grandma fed the cat with fish heads, after cutting off the heads and cleaning fishes before progress with cooking. 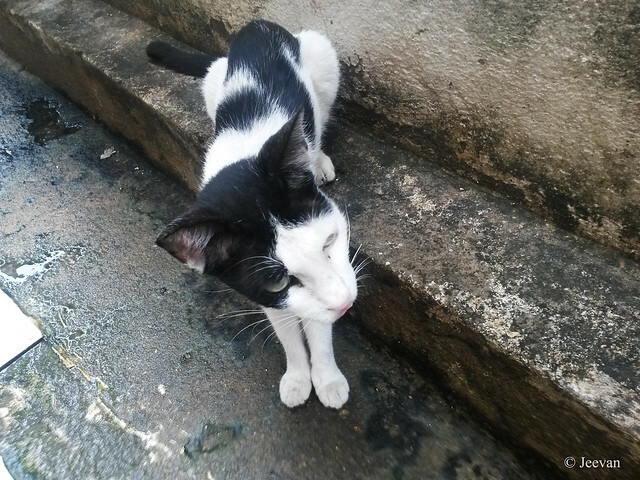 Generally we don’t encourage cats and after owning a dog we stopped petting any other and not only because our dog hate cats, it’s also not easy to detach once become friendly. It is an experience we leant through many occasions of losing pet dogs and cats, to keep us away. 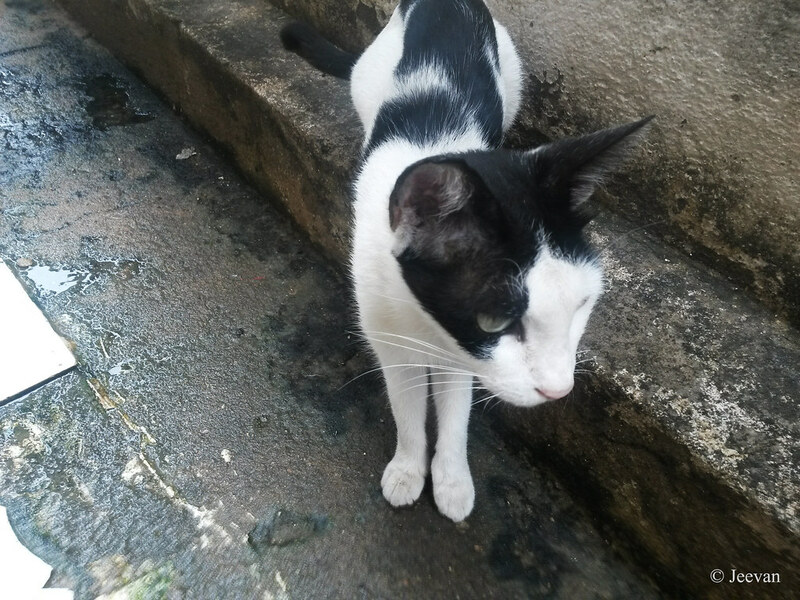 This black and white kitty is so daring animal and doesn’t seem to fear about our barking dog and come around bravely with meow, how many times we shoo away! Other day, the cat quietly came under our couch while we eating fish curry and mom was shook for a moment seeing the cat there, which was a look strange for her rather the usual sight of our fluffy white dog. It came in, when our dog was sleeping inside and didn’t move out easily until we put forceful shoo. Apart this there are two more cats – one with black and white with orange and other was a tabby cat, but they aren’t annoying like this BW though they come around our home often. Even while writing this post it’s making purr from the compound wall to let our dog bark. 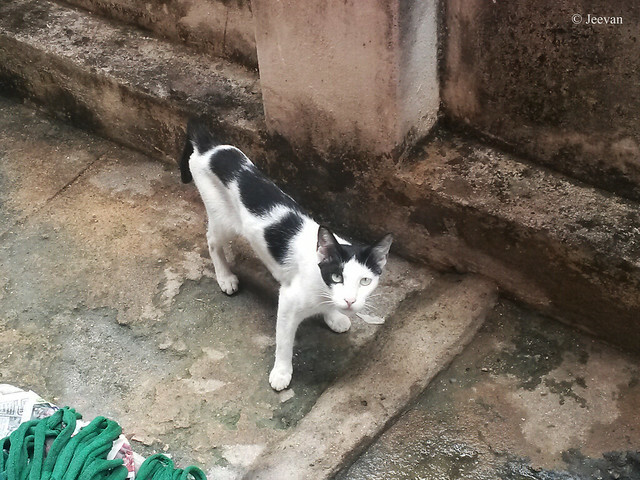 You might know the boldness of this cat from the photos above, which was shot from closer distance through the back door and in one of it; it was giving pose for us, looking at the mobile camera. Linking this post with SATURDAY CRITTERS - for the firs time. 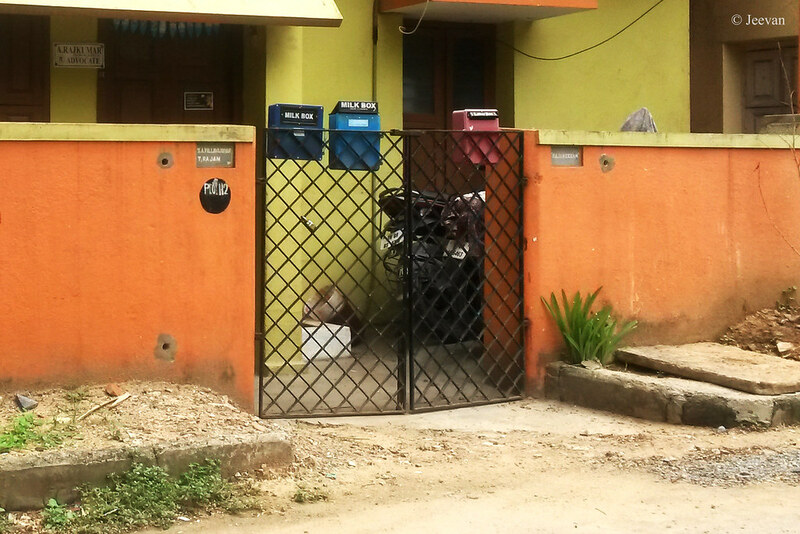 Few weeks’ back I was at KK Nagar and come across few streets where I find couple of gates of houses adjoining one another. What interest me to capture these little gates were the letter and milk boxes hanging from each other. 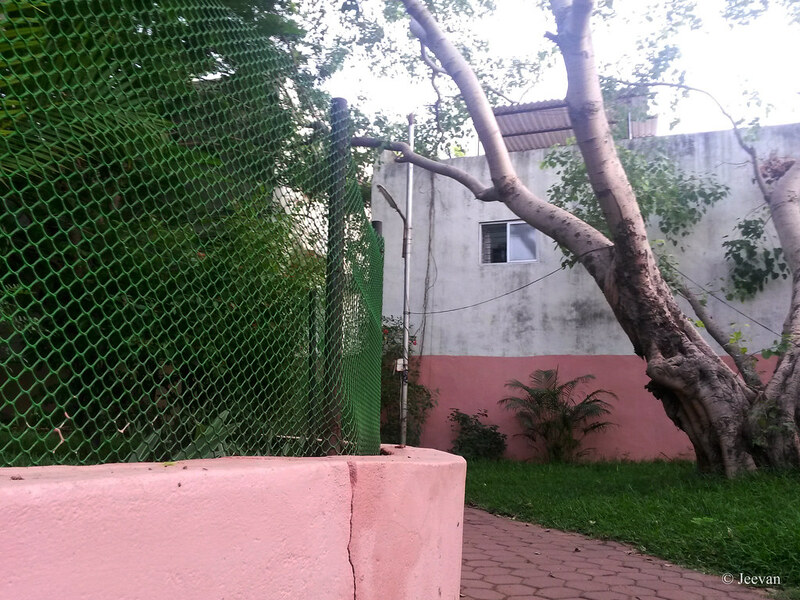 Both were ground plus first floor and the house above was painted in bright orange and light green combo. 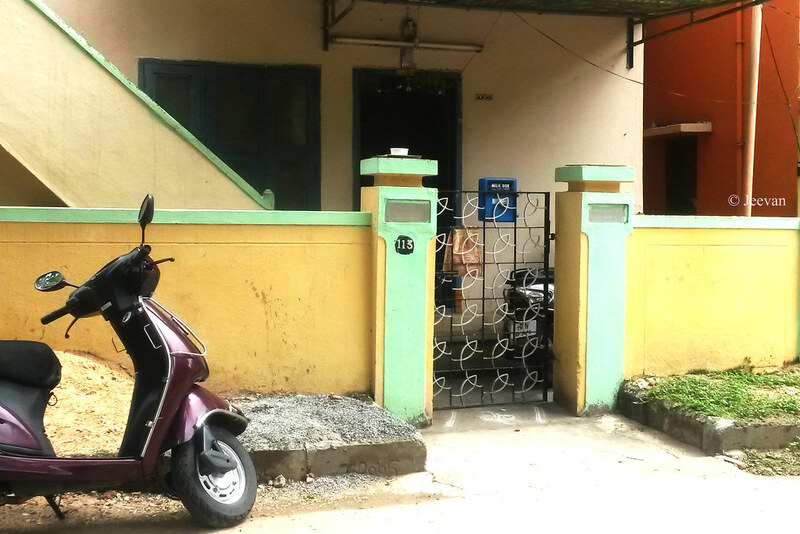 The houses on this street where built in a row and this house has a twofold gate with three boxes – one red letter box and two blue milk boxes. Like the red letter box, the blue milk box is also slowing becoming my favorite thing and I find more gates with milk boxes these days than the red letter boxes. Apart the blue milk box, in the gate above, I also liked the simple design of the gate which seems patterned in fishes! First I spotted this kind of bug in the Theosophical Society in the neighborhood (Adyar), around a muddy terrain and fallen leaves. About half a decade later, I was surprise to see this bug inside our compound wall and again around the fallen (dry) leaves of Neam and an unknown tree of the neighbor. I spotted the bug few months back and days after showering, the bug was wandering around the dry leaves for its prey. And last week it decided to stick to the compound wall sometime for me to shoot. P.S. 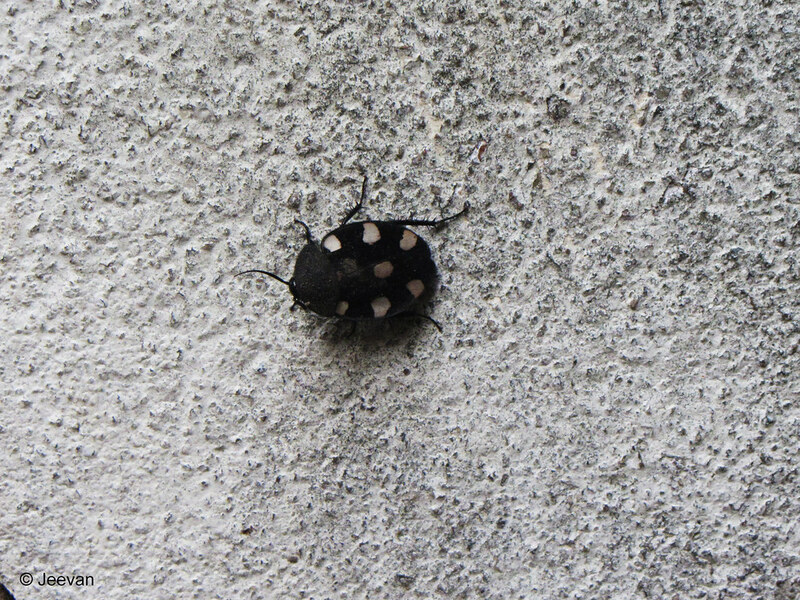 Thanks DI (Destination Infinity) for letting me know the real name of the bug in comment, which I referred early as white spotted black bug. My New Powered Wheelchair – Disappointments and Comforts! I was looking forward for a new wheelchair from the time I started to experience back pain (from the beginning of this year) and that’s mainly because of the pelvic misalignment and mild scoliosis in spine that we find through a diagnosis in April. 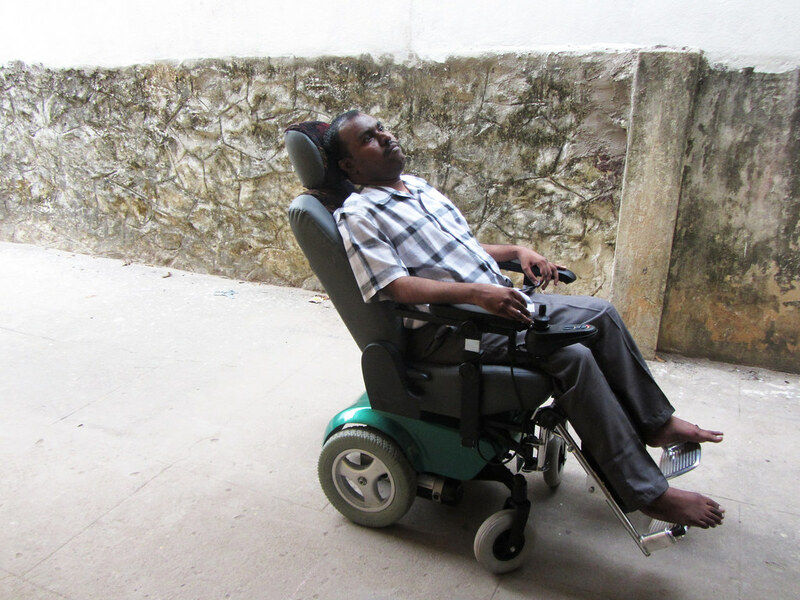 Without delay we approached a leading wheelchair manufacturer in Chennai to get a comfort wheelchair that perhaps decreases my back pain and prevent further spinal curvature. You might get more detail about the alignment and discomfort from my earlier post here. 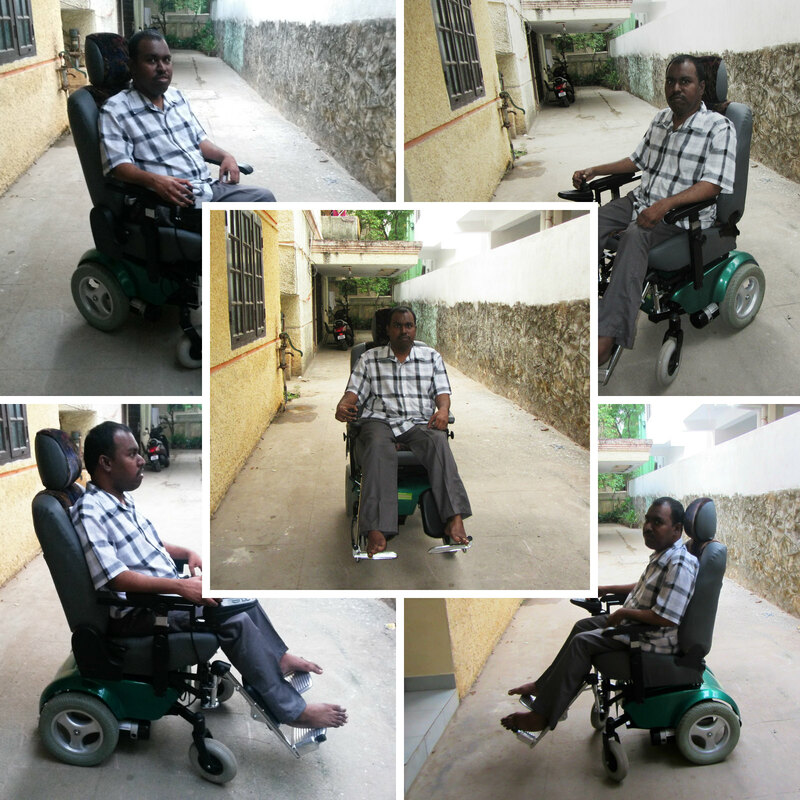 We placed an order on May 20 after discussing with him (the wheelchair manufacturer) at home; who came on our invite and as we know him already and being the manufacturer of my old power wheelchair, I thought he perhaps know my condition well and do his best to provide me the comfort I seek. Following his websites and the models he posted there, I thought of picking one from that that suits my need. But only listening to him at home reveals that those are models just to give an idea about the wheelchairs they manufacture to those unknown and he manufacture a wheelchair only on order. He sent me a quotation listing down the facilities on the powered wheelchair including the specs I requested, with a notification on delivery within 45- 60 days. Though I was quite disappoint with the days his delivery marks, I console later that my normal powered/electric wheelchair took 30 days to deliver about 8 years back, the deluxe perhaps take that much. But what really happened was I got the wheelchair only after 100 days. We started inquiring about the wheelchair from the minimum days to delivery, in hope he deliver as soon as possible since my condition wasn’t comforting. But he keeps extending his delivery period from week to week on a constant basis of our inquiry. He delivered the wheelchair on the day 101! To say the truth I was frustrated at the look of the wheelchair, which stood like a robot with big boot and being taller than expected I was somehow taken aback. I had no idea how he going to design my wheelchair. Because he hadn’t showed me exactly how the wheelchair would come up and also I hadn’t thought to ask him about the wheelchair height (from the ground to seat) as I didn’t find great difference in height when checking the wheelchair models in his website. Though the seat height is just about 4” more than the old wheelchair there’s great difference when putting me to seat. Perhaps it could become normal as we used to but right moment it matters lot! I have nothing to complain much about seating in this new wheelchair, which has a bucket seat to sooth my back and very comfortable sitting to relax with reclining backrest and elevating footrest and handling! The wheelchair is much powerful than the previous one, where I used to drive in 3 of the total speed of 5. But in this I get the speed of riding on 3 in 1 apart the top speed of about 10-12 km/hr in 5 speeds. Though I feel comfort and increase in my level of confidence with the power of the new wheelchair, I somehow dislike on the look. The base and bottom of the wheelchair look disdain and the color of green isn’t likable and rather being thematic it outshines oddly. I am a person don’t want to be noticed unnecessarily in public and the same goes to my wheelchair and I want it to look decent and though it wasn’t appealing much, I wish it was grayish instead being green. This wheelchair doesn’t come out exactly what I anticipated but it need to be rectify a lot to be more comfort and we have also stressed him to reduce the height of seat as main cause. I don’t feel any discomfort with the height but my parents do find hard to put me on seat. I took the wheelchair to road couple of times to check its ability and to see how comfortable it was on the long run. And few days back I took it to the doctor clinic, across the main road (LB road, Adyar) to check for my cold. The wheelchair is said to run 15 km per charge, but I guess it should be giving less than 10 km. Hope to test it more after the rectifying process, where the wheelchair will be brought back to the company. There’s nothing like pedaling the bicycle as fast as I can, though my maximum speed is almost below normal there’s a feel of achieving something that when exists from my own strength and energy is unequal to anything. I think not only cycling, but anything that has a personal touch and contribution from same is always special. Even though we have or get assistance from others on any job/work but when it comes to things we are passionate or close to be, doing it on self is something satisfactory that no one could repudiate. Sometime I feel lack of power to pedal the cycle and those times what help me (to move ahead) were the ramps built in front of many houses and my uncle having his own workshop with ramp in front of it to make way cars enter the garage. I used to bring the cycle above the ramp and pedal fast along with the force to cover certain distance and repeat it from some others ramps. Cycling is one of the best parts of my active life then and the only vehicle I drove on my own using my ability. I got great control over the handlebar by propelling the cycle helped me to drive Scooty (a sort of Scooter), but rather independently I ride it with the help of my dad who used to support from pillion when the bike need to halt, as I can’t balance its weight on foot. But those are a decade and a half old story. I have drove bicycle for more than 6 years but I wasn’t powerful unlike when I started to pedal bicycle and as I lose power subsequently and walking becomes difficult I quit cycling. The memories of cycling are always evergreen, although I couldn’t remember all of it, certain incidents and phases continue to exist. Thanks to Aarumugam (six face) and if he hadn’t spent time teaching us cycling we couldn’t have got the opportunity to learn quickly since every other was busy with their lives. Not that riding cycle alone is fun but also going for a ride with your friend or favourite person who could pedal fast. I don’t remember my father or mother following our cycle journeys; it was the employs of the workshop run by the uncle whom we interact mostly and it was a time I was drop out of school for a year and I used to spent all the time with them and it was Arul (a young employ at workshop) used to take me for speed rides in cycle which I find so thrilling. Sitting sideways on the centre bar and holding the handlebar it was fun to kick start a ride and it is a way I used to go around with my neighbourhood friend who has enough ability to pedal me along. Many a time there used to be clash between me and my brother over driving cycle and sometime I along with the friend put him wander (street-by-street) by driving fast and let them chase away. But many a time he has been supportive to me and pushed the cycle for me to drive fast. I have also drove hire cycles few times and though I had a wish to try different cycles and when my brother refuses to give me a change I took for this. I remember I liked and feel easy to drive the Anjali cycle (a bicycle which was famous then following the Tamil flick Anjali); it has a long and narrow seat with back support and could accommodate 2 kids at a time. The hire fee used to be Rs.1 per hour but I leave the cycle before the time, even though the shop keeper doesn’t seem to be accurate I fear what he may say. 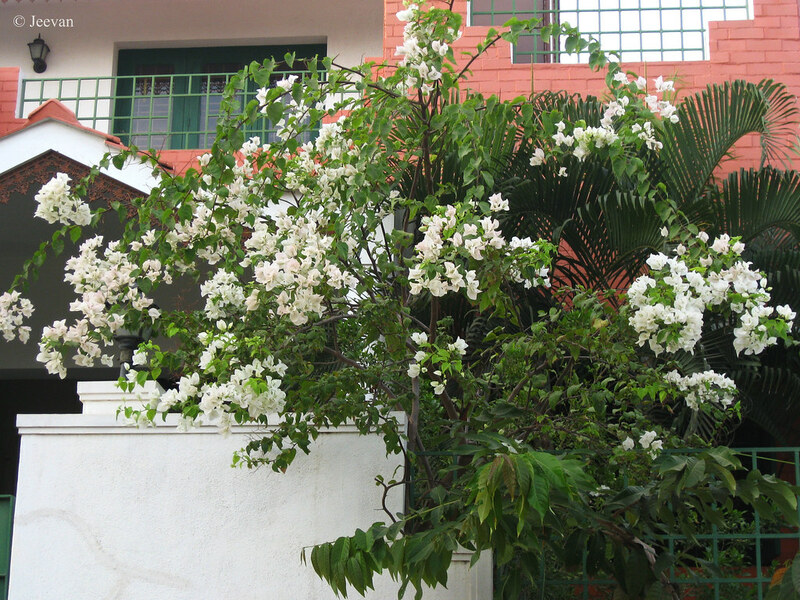 When we shifted to our grandpa’s house for a year, while we reconstruction our home, and being close to my school I got to cycle along with my classmate for some time and the street of our grandpa’s used to be crowded so we mostly end up lifting the cycle to terrace to make little rounds. 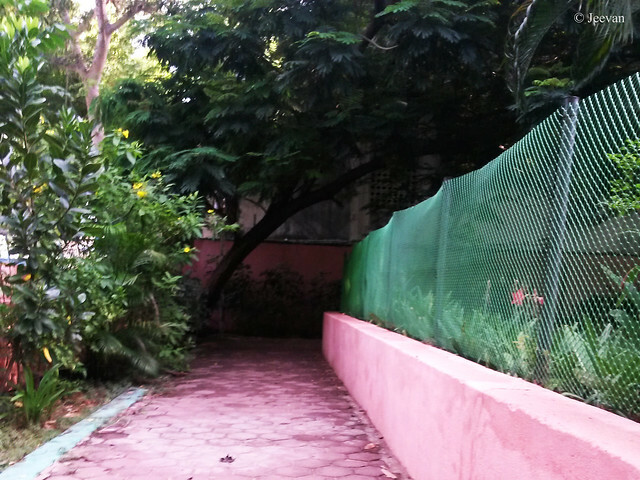 It used to be a large terrace with all sides wall; it feels safe to ride on. The bicycle we used has been a worth product (BSA Champ) and worked for long years, which has been used by our other two cousin when my brother brought another for him. My first bicycle ride (not pedalling) I remember was with my father. He took me to home from grandpa’s making me stand on the bar holding his shoulder in one arm. I really hate sitting on the bar as it make feel discomfort, I always wish for a baby seat (a small seat on the bar connecting handlebar and seat) which has been in my friend’s father cycle. The days that are close to my heart and final rides of me on a bicycle were with my grandpa. Sometime if no one comes to pick me from school, which is near his home, he would come in his bicycle and put me seated on the carrier and the school bag in the handlebar he make a great balance despite his difficulty in climbing and pedalling. I would cherish those moments forever and it bothers me much when I see him fighting with Parkinson latterly.